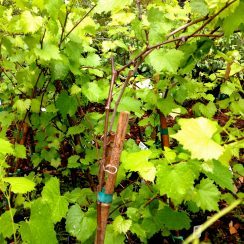 Growing Grapes in the Gainesville Area | Garden Gate Nursery - Gainesville FL better selection. better advice. Let’s face it. Our region is not known for producing world class grapes. In Gainesville, you won’t see prestigious vineyards pumping out high-end wine like they do in Southern California or the Mediterranean. But that does not mean we can’t grow certain varieties of grapes and do it well! In fact, Growing your own grapes in Gainesville and the surrounding regions can be quite simple. A few simple tips can go a long way in cultivating grapes for our area. Plant in Full Sun. Exposure to at least 6 hours of direct sunlight is essential to keep grape vines healthy year-round and ensure production of fruit. Purchase Self-Pollinators, then get Female Varieties. Self-Pollinators will produce fruit themselves without another plant. They will also pollinate other female plants. If you purchase a female plant alone, make sure you already have a self-pollinator nearby. Establish Good Spacing (10′ to 12′ apart). Spacing your grapes a healthy distance apart will ensure even exposure to the elements and prevent overcrowding at maturity. Fertilize in the Spring. It is important to fertilize your grapes early in the Spring before the new growth begins. Any good Fruit Tree Fertilizer would work well. Beware of Cold Tolerance. Most Grapes zoned for our area can handle temperatures in the 10 to 20 degree Fahrenheit range. In our region, temperatures can reach these lows only a handful of times during the Winters. Keep Up with Moderate Water Usage. After planting, keep the soil moist until your new grapes are completely established; once established, keep a moderate watering schedule or simply water as needed. Here at Garden Gate Nursery, we carry a wide variety of Muscadine Grapes that are perfect for our region. Below are some varieties we usually keep stocked. Muscadine Jumbo: Female variety (needs a pollinator nearby) that is good for fresh eating. Muscadine Carlos: Self-Pollinating variety that produces a medium-sized bronze fruit. Carlos are vigorous growers that produce a high yield in fruit making them good for fresh eating, wine production, and juice pressing. Muscadine Noble: Self-Pollinating variety that produce a small-black fruit. Noble are good for jelly making, wine production, and juice pressing. Muscadine Fry: Female variety (needs a pollinator nearby) that produces very large bronze fruit. Fry produce large clusters with excellent flavor (a sugar content of 21%) that make them perfect for fresh eating. Muscadine Granny Val: Self-Pollinating variety that produce a bronze fruit. Granny Val are known for having very high yields in fruit. Muscadine Summit: Female variety (needs a pollinator nearby) that produces a bronze fruit. Summits are very high quality grapes with the thinnest skins of all the Muscadines. Muscadine Triumph: Self-Pollinating variety that produce a bronze fruit. Triumphs produce in the early to mid-season making them good for fresh eating, wine production, or juice pressing. Our entire selection of Grapes (including Muscadine Grapes) are 20% off this week. Stop by our shop on NW 43rd Street and check out of selection.